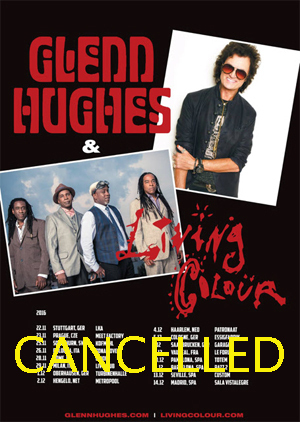 Glenn Hughes is forced to cancel his UK and European tour today after the co-headliner LIVING COLOUR booked a conflicting support slot on ALTER BRIDGE’s European tour. New management for LIVING COLOUR knowingly booked them onto the ALTER BRIDGE tour although they were already confirmed for the Glenn Hughes co-headline tour, which had been on sale since April. ALTER BRIDGE and Glenn Hughes have been long-time friends and neither ALTER BRIDGE, their management and agents or even LIVING COLOUR’s agent TKO were aware that this was taking place. Glenn Hughes was planning on touring Europe in support of his upcoming solo album, Resonate. When word got to promoters that LIVING COLOUR were no longer planning to perform on the co-headline dates, they were forced to refund all tickets. All ticket holders of Glenn Hughes’ UK and European tour will be offered refunds at the point of purchase and can call the venues for more information. Glenn Hughes’ new solo album, Resonate, has been receiving critical acclaim from media and fans alike. The album will be available in two configurations: regular CD and deluxe edition including one bonus track and DVD. The Deluxe Edition includes the bonus track "Nothing’s The Same", plus a bonus DVD disc featuring the ‘Making of’ the album documentary – "Heavy", and "Long Time Gone". A vinyl release will be made available via the Frontiers’ label partners Soulfood Music. The album is available for pre-order via Amazon, iTunes and Google Play. The single "Heavy" is also available on Spotify with the full album streaming on release date. Resonate was produced by Glenn Hughes and Soren Andersen. Glenn Hughes, the legendary ‘Voice Of Rock’, has been a fixture in the music industry for over 35 years. In that time, he has become one of the most-respected and influential performers through his work in TRAPEZE, DEEP PURPLE, BLACK SABBATH, BLACK COUNTRY COMMUNION as well as his solo career.